The Tax Cuts and Jobs Act: Will Your Taxes Go Up or Down? President Donald Trump dedicated a good portion of his campaign to promising sweeping changes to existing U.S. tax policy, and that finally happened on December 22, 2017 when the Tax Cuts and Jobs Act (TCJA) was signed into law. Not surprisingly, so many changes left many Americans scratching their heads as these tax changes took effective in 2018. Will they end up paying more in taxes, or less? It depends. The TCJA's impact is highly dependent on individual circumstances. Two individuals earning the same income dollar-for-dollar might find the new law impacts them differently. There are still seven tax brackets, but the tax rates are reduced a little. The standard deduction has effectively doubled for all filing statuses. The child tax credit has increased, and an additional family-related credit has been added for non-child dependents. Several tax exclusions and deductions have been tweaked. The state income and property tax or local sales tax deductions are now capped at $10,000. Deductions for medical expenses must now exceed only 7.5 percent of your adjusted gross income rather than 10 percent. The above-the-line alimony deduction has been eliminated. The obligor has to pay taxes on this income now. The TCJA imposes new limitations on the home mortgage interest deduction. Mortgage debts of up to $1 million qualified for this deduction in 2017, but the TCJA slashes that to $750,000 and it eliminates this tax deduction for home equity loans. The law does not make any changes to deductions for 401(k) plan contributions. The earned income tax credit is unaffected. The terms of the Affordable Care Act are not yet subject to change. How Will This Affect Low-Income Taxpayers? The changes to tax brackets, the standard deduction, and the loss of personal exemptions could all have a big impact on low-income taxpayers. Let’s say that John, a single taxpayer, earned $16,000 last year. That would have put him in a 15-percent tax bracket in 2017. He would have paid 10 percent in tax on his income up to $9,325 and 15 percent on the balance of his income up to $16,000. That’s a pretty significant tax bill of $1,933: $932 on the first $9,325, plus $1,001 of the $6,675 balance, for a total of $1,933. The TCJA provides for a new 12-percent bracket for incomes from $9,525 up to $38,700 for single filers. John would pay 10 percent in tax on his income up to $9,525, but only 12 percent on the balance. As a result, John's 2018 tax bill would come out to just $1,729 compared to $1,933: 10 percent of $9,525 or $952, plus 12 percent of the $6,475 balance or $777. That's $204 less, pretty significant for someone who earns just $16,000 a year. The above scenario doesn’t take the standard deduction into consideration, and this makes a more dramatic difference. Under the terms of the TCJA, John does not pay taxes on the first $12,000 of his income—the new standard deduction amount for single filers in 2018. After the standard deduction, his actual taxable income is just $4,000, meaning his actual tax would work out to $400, or 10 percent of $4,000. By comparison, John got a standard deduction of $6,350 in 2017, so he paid taxes on $9,650— $16,000 less his standard deduction of $6,350. His total tax bill came out to $980 in 2017: $932 or 10 percent of the first $9,325, plus $48 or 15 percent of the $325 balance. The final result is that John comes out ahead under the terms of the TCJA. Due largely to the change in the standard deduction, he would pay $400 under the new tax law, compared to $980 under the 2017 tax structure. We’re not done yet. Remember that personal exemption that the new law eliminates? John would have been able to further reduce his taxable income by an additional $4,050 by claiming that exemption for himself in 2017. He would pay tax at the rate of 10 percent on just $5,600 in income: $16,000 less the standard deduction leaves $9,650, less the additional $4,050 for the exemption. His $980 tax debt now drops from $980 to just $560. Here's the final analysis: John would have paid $560 in federal income taxes in 2017. Under the TCJA, he pays $400. So the TCJA saves him $160 a year. That's not a huge windfall, but again, for someone in this income range, it's nothing to sniff at, either. Supporters of the TCJA say that many low-income taxpayers come out ahead in 2018. Of course, this all assumes that John isn’t eligible for any tax credits. But what if he has a child dependent so he can claim the child tax credit? The child tax credit was $1,000 per child under age 17 in 2017. The TCJA pushes this up to $2,000 per child, an increase of $1,000. The first $1,400 is refundable. This means that a parent with zero tax liability would receive a refund from the IRS for $1,400 for each dependent child he can claim. If John’s tax bill was $400 and he could claim the child tax credit for one child, the tax credit would wipe out his tax debt so John would end up not owing the IRS anything at all. That leaves $1,600 remaining of the $2,000 credit, of which $1,400 is refundable. So John would actually receive a $1,400 refund. Now let’s say that John is married and he has four kids. He earns $50,000 in this scenario and his spouse earns $25,000 for a total joint income of $75,000. This still puts them in a 12-percent tax bracket under the TCJA because this bracket stretches up to $77,500 in joint incomes. Back in 2017, they paid 15 percent in tax in this bracket—an additional 3 percent. But they’re losing those six personal exemptions under the new law, one for each of them and one for each of their children, for a walloping total of $24,300—$4,050 times six. So John and his spouse would end up paying taxes on $24,300 more in income, which neutralizes that 3-percent break they’d get on their tax rate. Of course, they’d potentially get $8,000 of that back—$2,000 per child—thanks to the revamped child tax credit, but they'll still be paying taxes on more income than they did in 2017. Middle-class taxpayers shouldn’t fare too badly under the new tax law, either. But once again, it depends on personal circumstances. The math on the new tax brackets pretty much works out the same way as it does for low-income taxpayers. The new income parameters reduce the tax percentage for many middle-class filers. The 25-percent tax bracket began for single filers with incomes of $37,950 last year. Under the new law, a single taxpayer can earn up to $38,700 before finding themselves in a higher tax bracket—not a huge difference. But again, the new tax rate for this bracket drops, in this case from 25 percent to 22 percent. 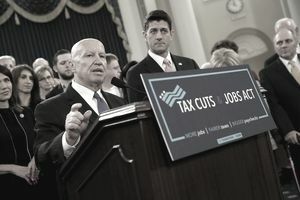 But a higher percentage of these taxpayers have historically chosen to itemize their deductions rather than claim the standard deduction for their filing status, and the Tax Cuts and Jobs Act can be expected to affect them in this respect. Under 2017 tax law, their total itemized deductible expenses could well exceed their standard deduction because it was roughly half of what it is now. This could have made it more advantageous for them to itemize. Currently, a single taxpayer who averages about $12,000 in itemized deductions would find himself in pretty much the same tax situation under the new plan whether he itemized or claimed the standard deduction for his filing status. But one who has historically claimed $15,000 in itemized deductions would find himself paying tax on an additional $3,000 if he chose to claim the standard deduction rather than itemize. And itemizing might not reap the same tax savings under the TCJA because the increased standard deduction also interacts with the cap on state and some local taxes and limitations on mortgage interest deductions. These taxpayers might well end up having less in the way of itemized deductions. The theory is that the increased standard deduction is supposed to balance that, but will it really? As for that revamped child tax credit, more middle-income earners will qualify for it under the terms of the TCJA. The credit began phasing out or reducing at incomes of $75,000 or more in 2017. John and his spouse would have just made it in under the wire at a joint income of $75,000. The new tax law increases this limit significantly to $200,000 for single filers and $400,000 for those who are married and filing joint returns. This allows many more middle- and upper-income families to take full advantage of the credit. So does a middle-income taxpayer win or lose under these changes? It depends. Does he have children? How many? Was he claiming a lot of itemized deductions that would now be eliminated? Opponents of the Tax Cuts and Jobs Act argue that it unfairly favors the wealthy. And in some cases, that might appear to be true. Many of these taxpayers will fall into a 37 percent tax bracket in 2018 as opposed to the top tax bracket of 39.6 in 2017. That 2017 bracket kicked in at incomes of $418,400 or more for single filers. The 37 percent bracket provided for by the TCJA begins with incomes of $500,000 for single filers, or $600,000 for taxpayers who are married and filing joint returns. So, yes, some wealthy taxpayers will get a break there. The wealthy can pass more of their largess to their heirs tax-free as well. The TCJA provides for an $11.18 million estate tax exemption in 2018. As of 2017, the exemption was only $5.49 million. Low- and middle-income taxpayers have always dodged this tax so there’s no big change for them here. But now some wealthier individuals might be able to stop concerning themselves with the estate tax, too. These changes aren't necessarily permanent. The TCJA rules for tax years 2018 through 2025, then it sunsets or expires if Congress doesn't act to breathe new life into it for another stretch of years. Whether it helps your tax situation or hurts it, the TCJA might not be forever. NOTE: Please consult with a tax professional for the most up-to-date advice and answers to any specific questions you might have. The TCJA includes many more changes that are not summarized in this article and that could potentially affect your tax situation. The information contained in this article is not intended as tax advice and it is not a substitute for tax advice.